This is the time of year when we all start having lots of guests dropping by and it is nice to have some holiday treats on hand to share with your visitors. This White Chocolate Cranberry Biscotti Recipe is perfect because it is fancy enough for guests but not too complicated to make. The cranberry biscotti are fabulous because they are a super tasty treat but not too sweet that you feel guilty letting your kids munch on them. Plus, biscotti can stay fresh for longer than most holiday cookies. This post is brought to you by Crest, reminding you to protect your teeth while indulging during the holidays. 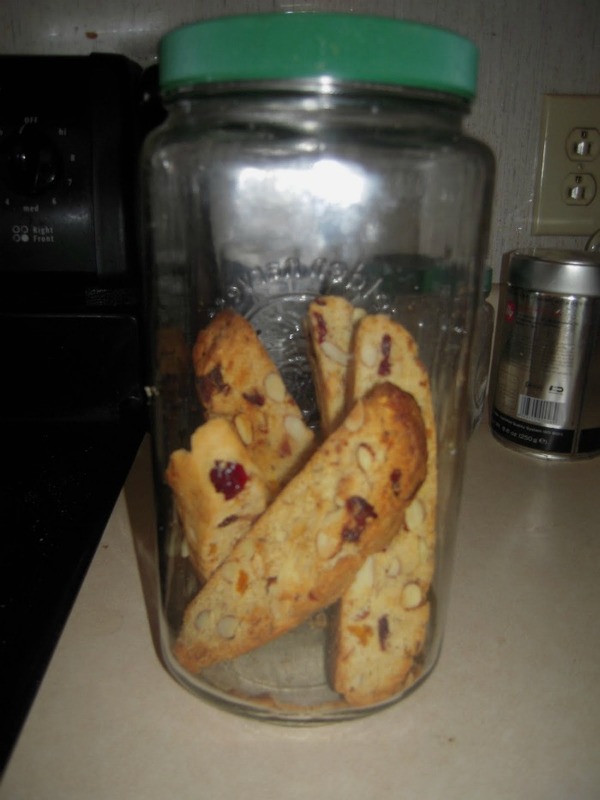 This white chocolate cranberry biscotti recipe can be easily modified. You can substitute pistachios for the almonds. Or if you don’t like nuts, just leave them out! If you prefer dark chocolate, go ahead and substitute that for the white chocolate! 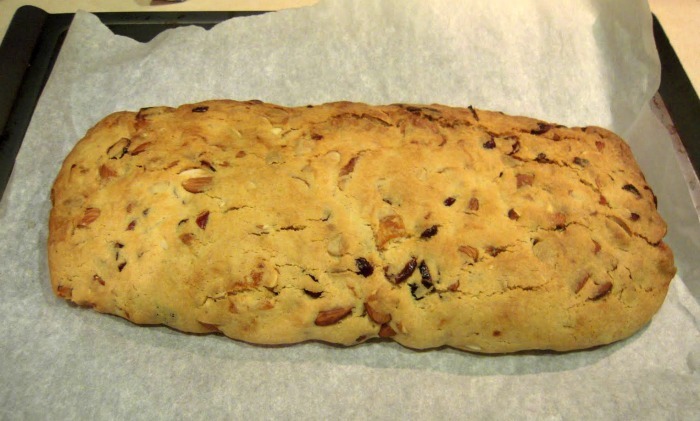 This cranberry biscotti recipe is perfect for a snack or a breakfast on the go. 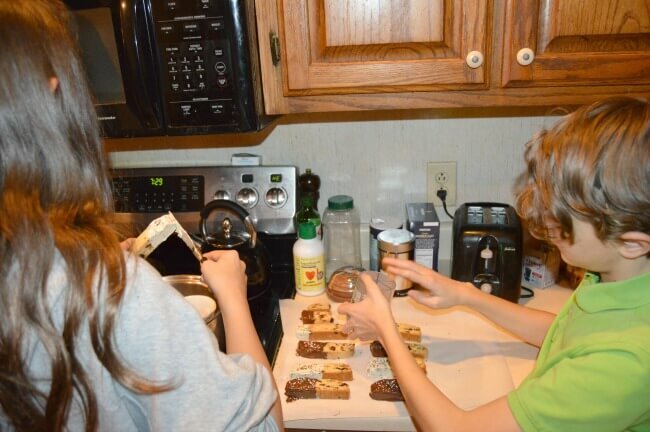 My kids love to help me cook and always help assemble the ingredients. Line a heavy large baking sheet with parchment paper. Mix the sugar, butter, and lemon zest, in a large bowl till well blended. Beat in the eggs until well blended. Add the flour, baking powder, and salt and beat just until blended. Stir in the the nuts, chocolate, and dried fruit of your choice. Form the dough into a long log (about 12 by 4) on the prepared baking sheet. Bake until light golden, about 40 minutes. Cool for 30 minutes. Cut the log into 1/2 inch thick slices using a serrated knife. Lay the biscotti out flat on a baking sheet and bake the biscotti until they are beginning to turn golden, about 15 minutes. 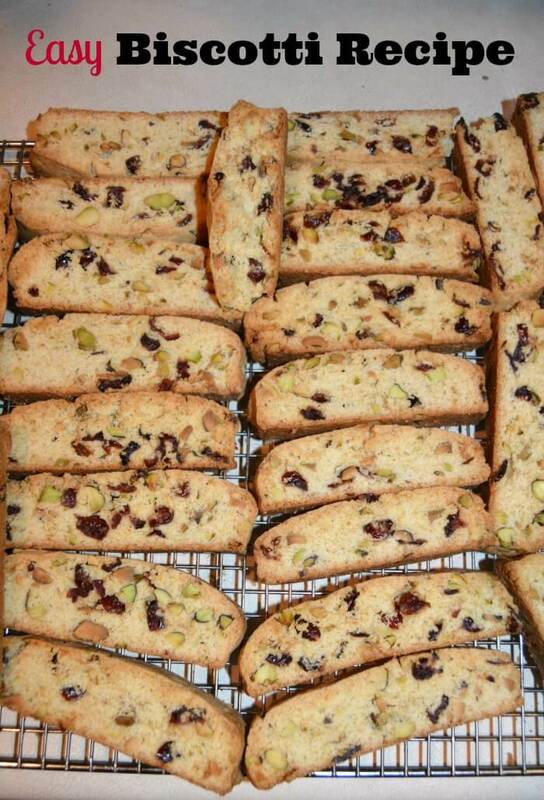 Transfer the White Chocolate Cranberry Biscotti to a wire rack and cool completely. You can serve the White Chocolate Cranberry Biscotti as they are, plain- or you can decorate them even more for Christmas. My kids like to help me dip them and them sprinkle them. We just melt pyrex dishes of white chocolate chips and dark chocolate chips in the microwave for the dip. You can put the White Chocolate Cranberry Biscotti in little jars and tie ribbons on them for a perfect DIY holiday gift! You can cut fabric squares to go over the lid of the jar and wrap with ribbons. Enjoy! 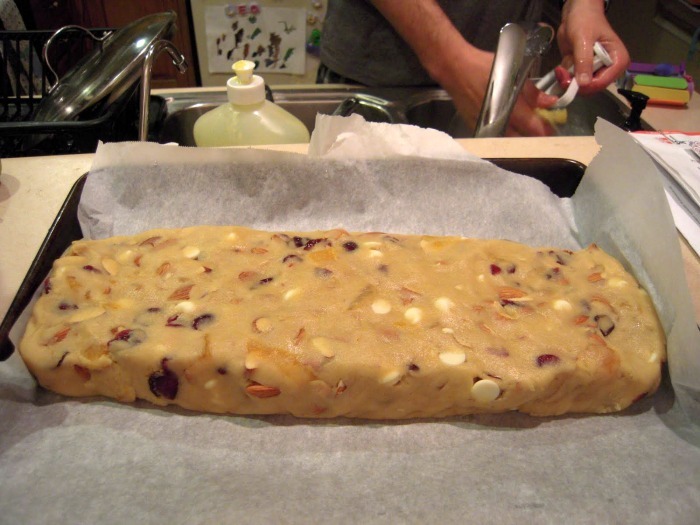 Printable White Chocolate Cranberry Biscotti Recipe is at the bottom of this post. ‘Tis the season for lots of delicious baked goods so be sure to use an extra strength toothpaste such as Crest Pro-Health Whitening Power to help you protect your teeth while indulging. Everyone loves a savings! Take advantage of the $2 Crest national coupon (looks like above image) that can be found in Sunday (11/25) newspapers across the U.S. 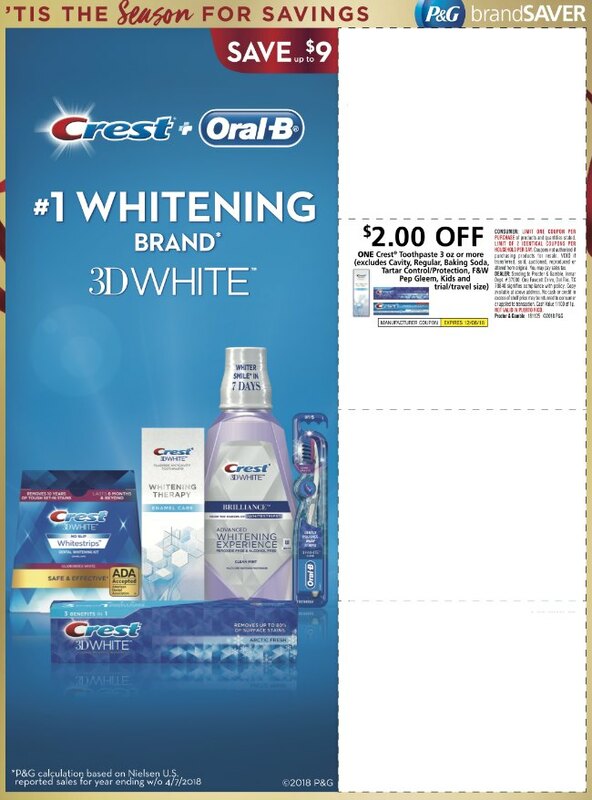 The national $2 coupon that can be used on a variety of Crest toothpaste products at your local CVS store. oral care routine and show your teeth some extra love. My kids know that it is more important than ever to make sure they are doing a good job with brushing and flossing during these final weeks of the year, after all, Santa is watching! We like using Crest Pro-Health Whitening Power because it offers extra protection. For more information about Crest Pro-Health, visit www.crest.com, like Crest on Facebook and Instagram or follow @Crest on Twitter to receive updates and learn more about good oral health. 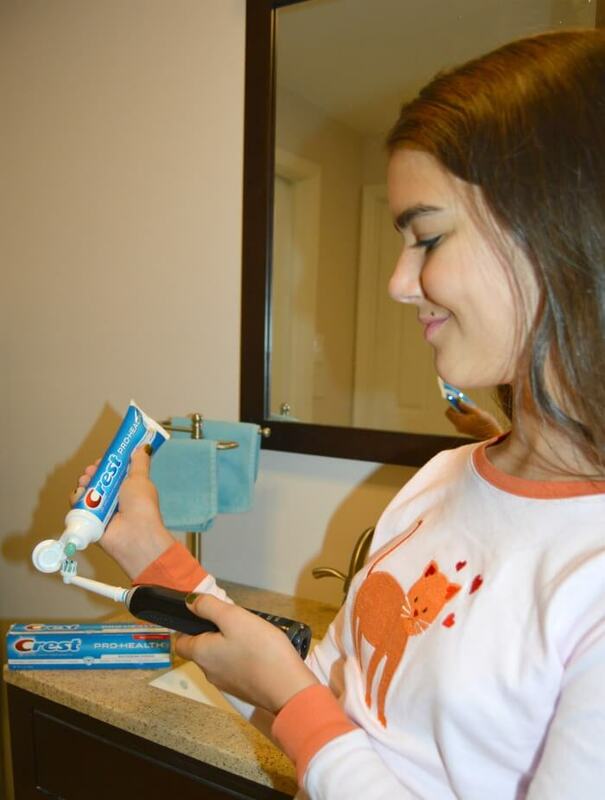 Have you tried Crest Pro-Health yet? Delicious homemade white chocolate cranberry biscotti that make the perfect holiday treat. Mix the sugar, butter, and lemon zest, in a large bowl till well blended. Add the flour, baking powder, and salt and beat just until blended. Stir in the the nuts, chocolate, and dried fruit. Form the dough into a long log (about 12 by 4) on the prepared baking sheet. Bake until light golden, about 40 minutes. Cut the log into 1/2 inch thick slices using a serrated knife. Lay the biscotti out flat on a baking sheet and bake the biscotti until they are beginning to turn golden, about 15 minutes. Transfer the White Chocolate Cranberry Biscotti to a wire rack and cool completely.